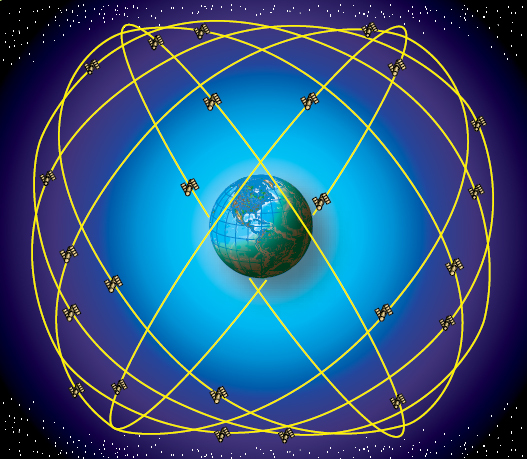 Space-based GPS, such as the U.S. GPS, the Russian GLONAS, or the forthcoming EU Galileo system all function on the same principles. In fact since the three systems use different frequencies and algorithms, in general receivers of all three systems can be more accurate than a receiver of just one system, since the system errors can be canceled out. Deployment of the NAVSTAR GPS constellation of satellites began with the first launch in 1977. The satellites were launched into precisely controlled orbits, allowing users with GPS equipment to receive data to determine their position. The phenomenal accuracy of GPS was its major selling point, but its many different applications were a close second. GPS determines a position referenced to a common grid known as the World Geodetic System 1984 (WGS 84). 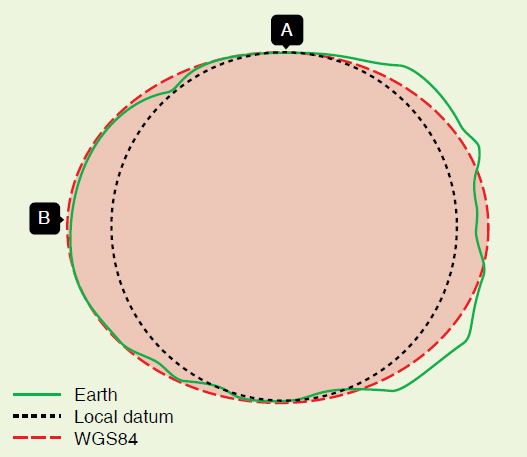 The WGS 84 grid is based upon a mathematical model and compensates for the fact that the earth is not a perfect sphere. [Figure 16-9] Derived using precise satellite measurements, it creates an accurate model of the earth’s surface. As a consequence, WGS 84 provides extremely accurate information when compared to older traditional datum references. The value of the WGS 84 grid is that positional data can be standardized worldwide. Many receiver sets are capable of converting WGS 84 data into these other commonly used references. Figure 16-9. World Geodetic System 1984. The GPS system is made up of three segments—space, user, and control. The space segment is deigned to have 24 satellites plus spares in 6 orbital planes. [Figure 16-10] The orbits are arranged precisely such that a minimum of four satellites are in view at all times worldwide. The user segment consists of user equipment (UE) sets, test equipment, and associated support equipment. [Figure 16-11] The UE set, using data transmitted by the satellites, determines the user’s position, altitude, and velocity. Transmissions from the satellites also allow the UE set to evaluate the accuracy of the navigational information being received. This is based on built-in checks of its own performance, the configuration of the satellite constellation in view, and the jamming-to-signal ratios being experienced by the set. Figure 16-11. Handheld user equipment set. The control segment includes a network of monitor stations and ground antennas placed throughout the world. [Figure 16-12] The monitor stations track all satellites in view and monitor general health of the system. Data from the monitor stations is sent to and processed at the Master Control Station (MCS). This data is then used to refine and update the satellite’s navigational signals. These corrections are transmitted to the individual satellites via ground antennas. The operational master control station is collocated with the Consolidated Space Operations Center at Peterson Field, Colorado. Three ground antenna stations are located at Diego Garcia, Ascension Island, and Kwajalein. Five monitor stations are positioned in Hawaii, Colorado, and at the three ground antenna locations. A UE set is capable of determining position, velocity, and time information by receiving ranging signals from a number of satellites. By measuring the difference between signal transmission and reception times and multiplying that time interval (Dt) by the speed of light, range to the satellite can be determined. In a general sense, this is very similar to the way TACAN DME functions, with one important difference. TACAN DME is an active system in that a signal must be sent from the aircraft to the selected TACAN ground station. The ground station in turn sends a reply signal back to the aircraft. The TACAN set then measures the Dt and then computes and displays the range to the station. 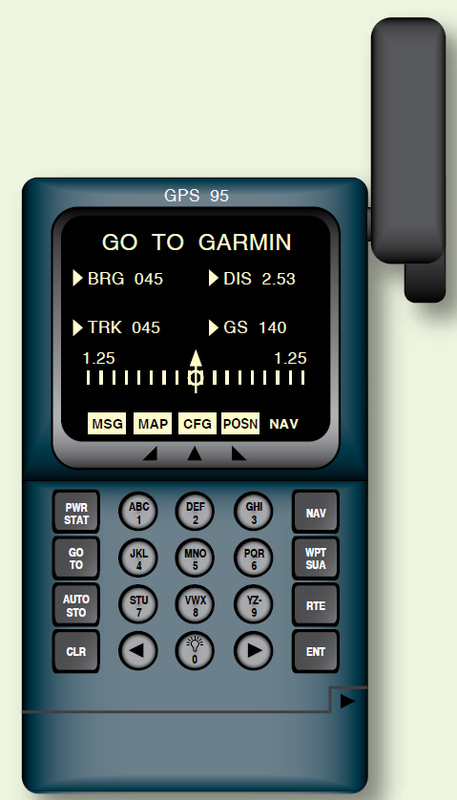 GPS is a passive system; no signal is transmitted by the UE set to the satellite. 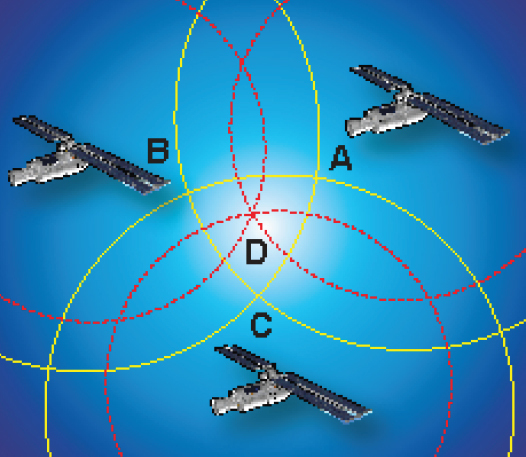 How does the user or receiver determine when the signal was transmitted by the satellite? The solution is to encode the satellite signal so the receiver knows when it was transmitted. If we know the satellite’s location in space and our distance from it, we know we are somewhere on the sphere having the satellite as its center. With two satellites in view, the user’s position is somewhere on the circle representing the intersection of two spheres. A third satellite provides an additional sphere of position whose intersection with the other two defines a three-dimensional navigation fix with timing errors. Figure 16-14 illustrates this concept in two dimensions for clarity. A fourth allows us to eliminate most of the timing errors. The accuracy of the navigation fix would be dependent on the accuracy of the measurement process (how accurately is the digital signal processed), the accuracy of the satellite positions, and the accuracy and stability of the satellite’s clocks and the receiver clock. The user equipment should be able to track the satellite’s signal to within 3 nanoseconds (3 × 10–9 seconds). This is equivalent to a 1-meter error in position. If navigational accuracy on the order of 10 meters is desired, we must be able to establish satellite position at a particular time to within at least 10 meters. This is not a trivial problem. Since the satellite is moving and is subject to complex gravitational attractions and solar winds, measuring and predicting its position within 10 meters as a function of time is quite difficult. Fortunately, this ephemeris (orbital) data is transmitted to the receiver in the form of almanac data. Figure 16-14. Resolution of position. Ground stations continuously monitor each satellite so its position can be corrected and passed to the other satellites in the network. Each satellite in reception range transmits its coordinates, a time factor correction, and other data. The receiver solves simultaneous equations for the unknown receiver coordinates and the correct time. Four channel GPS receivers can use one channel per satellite to maintain continuous lock on and update. Receivers with less than four channels must continuously switch frequencies and hunt for new satellites that can limit the system responsiveness. The satellites transmit two code signals: the precision (P) code on 1227.6 MHz and the coarse acquisition (C/A) code on 1575.42 MHz. [Figure 16-15] Both codes carry the same types of information. The C/A code is transmitted with intentional errors to deny the highly accurate position from unauthorized users. The P code, like its relative, the encrypted Y code, does not include these intentional errors. To circumvent the Y code encryption, differential GPS (DGPS) receivers are being designed that receive general GPS signals, as well as a fifth signal from a ground-based transmitter. These differential transmitters can easily determine the intentional error by comparing their GPS position to the surveyed coordinates of the transmitter. The difference is the intentional error. The ground transmitters compute and relay the amount of intentional bias in the C/A code so receivers can remove the position error without use of the P or Y codes.